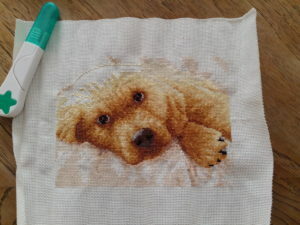 We watched the last four episodes of Hannibal last night and I made a lot of progress on the Golden Puppy! I finally feel like it’s going downhill, you know? I just have to fill in the head with one more color and finish the half stitches in the corner. Easy peasy. So I started this one in December 2008, which was before I got big into knitting and crochet. I lost the original pattern and emailed Dimensions about getting a new one. They sent me one for free a couple weeks later! That was in January 2014. I kept putting it away and forgetting about it until this year. 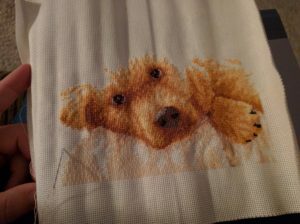 I didn’t know what to do with it when it was finished (which makes a difference in my motivation for finishing something), until I gave up on Man’s Best Friend. ta-da! I had almost come to terms with finishing it next year, but after last night I really think I can finish it by Christmas. 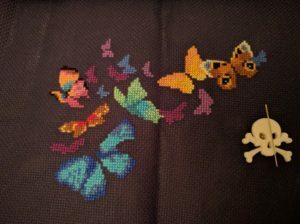 I also found the butterfly project at the bottom of a project case, under the Dr Who sampler. I did one more butterfly. I’ll make this the next portable project after the puppy is finished. Oh, wait. I should probably clarify what I mean by “portable”. 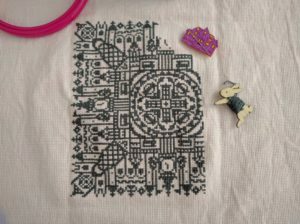 I think there are three kinds of cross stitch projects: portable, average, and epic. Portable projects are anything 5×7″ or smaller that can fit into a small tin or pencil box. I can fit them in my jacket or bag, no problem and aren’t too fussy (lots of color changes, blended thread, beads, special stitches, etc). Average is anything that isn’t too big or too fussy to carry around wherever. I use a makeup bag from Thirty-One to carry a few projects at a time and it’s super convenient. Dr Who sampler and Reflections of London are in that bag, along with most of my supplies. Epic, on the other hand, are not portable. They come with dozens of thread colors, multiple thread blending combos and many pages of patterns. My epics are mostly Dimension Gold kits (like Mighty Samurai) but a lot of people are into Heaven and Earth Designs or Cross Stitch Collectibles. I think these are epic in size alone, even if most of them don’t have more than cross stitches (no special stitches or attachments like beads). Since I’ve been flying through these old WIPs, I can’t help but think about my samurai. His name is Toshiro, btw. You know you’re a goner when you name something. ;-) I have the Dr sampler to finish too. At least that one is fairly portable. Toshi is not. I hope you have a wonderful day full of loved ones and good food. I hope you treat yo self to something nice, because you deserve it! Not just on holidays, every day, any day. You’re awesome! Thanks for reading! More stitch madness soon! P.S. I’m planning a few changes to the blog starting next year: planners, book reviews, lots of rambling, and lots more cross stitch adventures. P.P.S. Been working on London too, when I get tired of yellow thread. Almost out of thread again! I think this is my third skein of DMC 413. One more should do it.